Ravers are once again in the cross-hairs of angry city councillors. "One of the latest fads to hit Montreal's night life community are so-called needle parties," says Erin Sabina, councillor for Montreal's Griffinberg district. "The number of verified needle parties has doubled over the last two years. If the city doesn't do something soon, none of our parks will be safe for the public." Needle parties are an American tradition that have only recently found their way to Montreal. Junkies from across the city descend on a secret location, where they trade needles, drugs, and sexual favors. The goal of a needle party is to hide as many dirty, broken, used needles as possible in a public setting. "It's kind of like hiding Easter eggs," says Jane Goodwin, a veteran needle party-goer. "I've been to a dozen needle parties, and they're so much fun. When you're not shooting up or getting laid, you're looking for places to hide your needles. It's like we're leaving little surprise gifts for people to find." Erin Sabina doesn't see it that way. "Used needles aren't gifts. 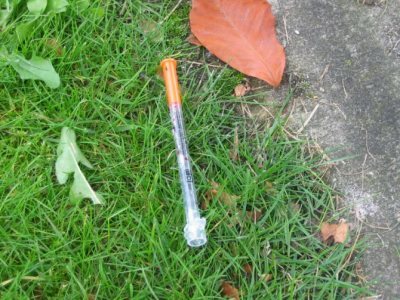 I don't understand how anyone attending these parties thinks that hiding needles in public is a good thing." George Weinberg, a needle party promoter, thinks the city councillors are getting worked up over nothing. "I think hiding needles for the public to find is a random act of kindness," says George. "Just picture this, you're walking around town with your friends, and then suddenly -- you find a free needle! Everyone love's free stuff. When we throw needle parties, we're giving back to the city. And I think we should be commended, not reprimanded for what we're doing." Alex Papadolopous went to his first needle party last weekend, and agrees with George. "It's great fun. I think the city should be subsidizing needle party promoters. They should be giving them grants. The party I went too at Narc Park, we must have hidden at least two hundred used needles. Just picture all the kids running through that park finding needles to play with! We're spreading sunshine and joy, man. Needle parties are the best kind of charity." Erin vows to step up her fight against the practice. "They're not spreading sunshine and joy," says the city councillor. "They're spreading diseases."